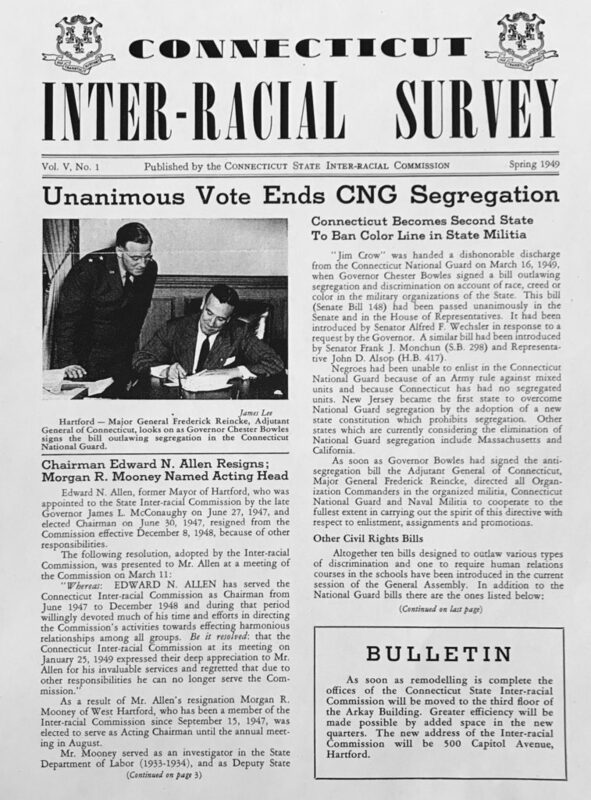 “ ‘Jim Crow’ was handed a dishonorable discharge from the Connecticut National Guard on March 16, 1949, when Governor Chester Bowles signed a bill outlawing segregation and discrimination on account of race, creed, or color in the military organizations of the State,” said the Spring Connecticut Inter-Racial Survey. The bill was introduced by a Senator Wechsler and pushed through by the Governor to a unanimous vote. 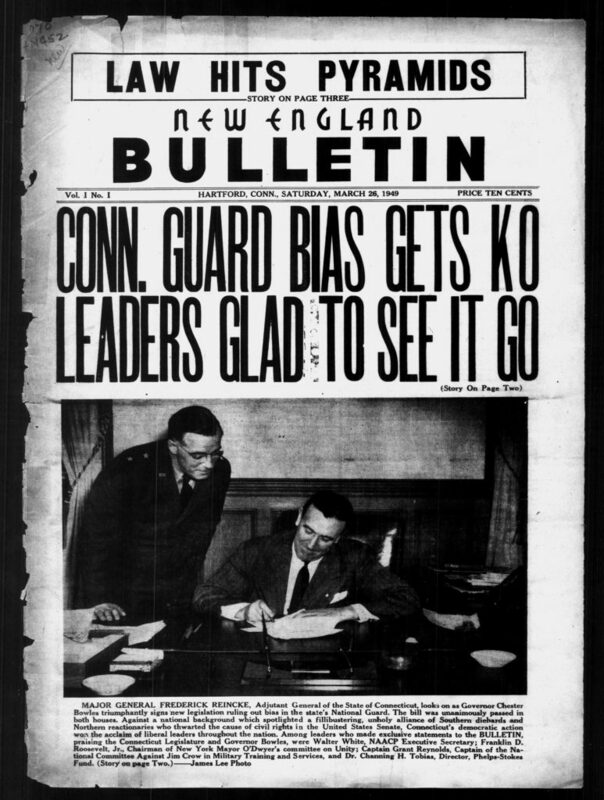 The Chronicle editor claimed, on page 2, that it was through the newspaper’s action that important national leaders learned of the bill and communicated their endorsement of Connecticut’s bold action, which made the state only the second in the nation (after New Jersey) to desegregate their Guard. Franklin Delano Roosevelt, Jr., who was head of the NYC Mayor’s Committee on Unity sent his greetings, as did Walter While of the national NAACP. 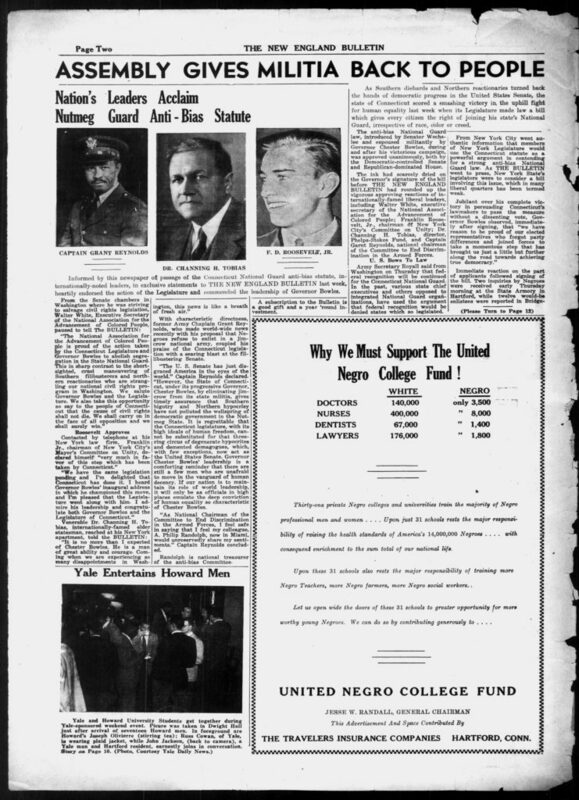 Captain Grant Reynolds, colleague of A. Philip Randolph and National Chairman of the Committee to End Discrimination in the Armed Forces, weighed in as well. A modest run of the Connecticut Chronicle and other titles in its newspaper family will soon be available for free online in the Library of Congress database called Chronicling America. Previous story When the Temperature Hits 12 Degrees. . .